In case you missed it, we are playing Real Madrid AGAIN on Wednesday night in the UEFA Champions League semi final first leg at the Santiago Bernabeu. I’m actually going to keep this preview shortish because I think we have all debated and thought about not only this game, but the previous ones as well, more than enough. Whether history, or the results in the previous games will matter or if Madrid has more momentum than us, or whatever else you can conjure up, in truth, it means nothing. You just have to sit down for those 90 minutes and see what happens. Victor Valdes, Pinto, Puyol, Milito, Pique, Fontas, Alves, Montoya, Busquets, Mascherano, Thiago, Sergi Roberto, Iniesta, Xavi, Keita, Afellay, Pedro, Villa, Messi, Jeffren. The absantees will be Abidal, Maxwell, Adriano, and Bojan. And if you haven’t noticed, we now have no fit regular left back. Great luck and timing. The rumors are that captain caveman Puyol will return in that left back role that we has so awesome during the 2008/9 season. But back then, he was fully fit and match sharp. Big difference. Honestly, I don’t know the alternative. Keita can play there but I think that would be an absolute death-wish against the skill and pace of Di Maria, CR, and Higuain. The other 3 should be Alves, Mascherano, and Pique no question. Then the regular Iniesta, Busquets, Xavi, Pedro, Villa, and Messi should follow suit. Like I said post Osasuna, we really can’t look to our bench in this match. Fontas/Montoya are too inexperienced, Miltio is too slow and unfit, Jeffren isn’t good enough, and Afellay does not have the knowledge or experience yet to make a positive impact. Thiago is the only somewhat decent item on the bench, but some of his mental lapses and lazy passes could prove very costly. Madrid are only without Ricardo Carvalho due to suspension. It is a loss as Carvalho is truly one of the elite defenders in world football. But, they will just call in 15 million and 26 cap Raul Albiol. Or they could put Arbeloa on the right and bring Ramos in the middle with Pepe (my prediction), or Garray if he has done well in practice (less likely). Point is, they got options and one centerback out isn’t that big a deal. However, if Pepe does go back to the center they will miss out on that hack Messi role he did so effectively. Oh wait, they can just bring in top midfielder Lass Diara, or just pair 20 million Khedira with Xabi Alonso. Again, they got options. Upfront they are fully fit and those rather good reserve players Kaka, Benzema, and Higuain all had stormers versus Valencia and could fancy their chances. Yes, Madrid have a super deep, great quality bench. Still, I’d never trade places with them. I hate the way they hoard and waste/destroy talent. I hate that there has never been a coach more successful at this awful practice than Mourinho. Let’s be very clear. Madrid has NEVER outplayed us this season. Definitely not in the 5-0 thrashing, or the 1-1 stale mate, and despite the fact most and I agree Madrid “won” the 1st half of the Copa, they did not outplay us. What they did was outhustle us, out muscle us, and out run us. But I never in those 45 minutes felt vulnerable to their football. And in the second half we killed them. The exact same team that outran us the first 45 were tired and confused after the break and we were ripping more than enough holes in the defense to win that game. People exaggerate how well Madrid and especially exaggerate how well Mourinho “handled us” that night. Let’s be clear again. We are NEVER going to be able to play a top European side (Chelsea, Inter, Man United, Real Madrid) who come out to defend and counter attack and create 20 clear cut chances. NEVER. So please don’t expect it and don’t complain when it doesn’t happen. We will be patient, pass around, wear them down, try and crack their focus, and plan on creating 3 or 4 proper chances. If we convert 2 or 3, we win the game. Simple. Chelsea 2009, we only had one shot on target, but it was enough. Inter 2010; it was a cowardly referee who disallowed a legitimate Bojan goal, that’s why we went out to a 10-man defense. We were a scared Belgian referee’s whistle away from defeating the OH SO MAGICAL AND GENIUS MOURINHO. And against Madrid in both the recent games we created chances we either wastefully squandered or Casillas incredibly stopped. We have never been outplayed by Madrid this season. We lost because in sport you cannot always win. Sometimes you are unlucky, sometimes your opponent stops you, and sometimes your wasteful. If we eliminate these errors we win both those games easy. Does that mean we will win tomorrow, no. All I’m saying is we are well within our abilities too. We are still the better football team and unit. Can Madrid expose our defensive and fitness issues? Without question. That will be the danger tomorrow,: counter attacks and set pieces. We are going to have to hope Puyol has a few last ditch monster tackles in him, Mascherano shows his composure at centerback again, and Valdes is alert as always. Ok, I feel like I’m kind of going in circles now. Let’s not worry about this and that and whether our squad is too small, it’s too late. We have what we have. Let us just support and believe in the starting 11 tomorrow who in the past 3 years have shown us no reason to doubt them. Let’s believe in Pep Guardiola. And if we lose, IF we lose, take a deep breath (unless its like 3 or 4 – 0), remember it’s a two-legged affair, and let’s not point fingers and throw them under the bus. Tomorrow is going to be part one of the most epic UEFA Champions League semi-final I can remember. This entry was posted in Champions League, Match Previews. Bookmark the permalink. My heart is pounding. Come on TEAM BARCA!!! Don’t let stupid desicions of the ref. influence you. Covert the chances you create then it will be alright. He only lasted 10 minutes of the training session at the Bernabeu this evening and unless Guardiola is unusually playing Mourinho-like mind games we have another big set back. It seems Puyol will play, forming a back 4 with Alves, Pique and Mascherano, though the positions of Puyol and Mascherano may depend on where Ronaldo plays. Puyol’s fitness is unclear though he is sure to give everything, I’m just worried on what we’ll do if we lose another defender, we’ll be down to Milito, Fontas and Montoya. Keita will probably come into midfield unless Pep decides to throw in Thiago (unlikely). So we will probably start with Valdes, Alves, Pique, Mascherano, Puyol, Xavi, Busquets, Keita, Pedro, Messi, Villa. As a first eleven it is not bad (with Iniesta and Abidal we would have our strongest eleven) but on the bench we look very light with just Afellay, Jeffren, Milito, Thiago and the other two youngsters from Sergio Roberto, Fontas and Montoya to come on and change things. We will need a great effort but we can be pretty sure the players will give everything. Madrid are not just without Carvalho, they are also missing Khedira who is injured (unless it’s the previously mentioned Mourinho mind games). This tests Mourinho’s tough three man midfield idea, though he does have options – it will be interesting to see if he is tempted to switch back to a 4-2-3-1 system to make room for another attacking player (Kaka, Higuain for example) to assist Ronaldo, Di Maria and Ozil in attacking duties, but I think it’s more likely he will make use of his more defensive minded players (Granero, Lass, Arbeloa) to maintain a similar style to the last two games. Madrid: (4-3-3) Casillas; Arbeloa, Sergio Ramos, Albiol, Marcelo; Alonso, Pepe, Lass; Ozil, Ronaldo, Di Maria. Barça: (4-3-3) Valdés; Alves, Mascherano, Piqué, Puyol; Xavi, Busquets, Keita; Pedro, Messi, Villa. It’s going to be very very tough, just like last year we are not in our best moment but at least there’s no long bus trip this year. I’m not going to make a prediction but I did have a small bet on Pedro scoring the first goal. If we get to the final it looks like it will be Manchester United who got a good win over Schalke. I’d say Man u and Madrid are probably the 2nd and 3rd best teams in the world right now so it is going to be a mighty challenge for our depleted troops to lift the trophy. But let’s not suffer too much, this is a massive game against our biggest rival, we are fortunate to be living it so let’s enjoy it. No Iniesta? Damn. Well Keita is an incredible midfielder and perhaps tomorrow is his day to shine. He’s deserving of a big game start like this. Lot’s of pregame ruckus, too. Jose smells blood, I think. Exciting as hell. Nice lead-in post, as usual, just a bigger game than usual. i think the loss of iniesta is not a good sign. despite the fact we have messi and xavi still in, iniesta provides a very different sort of threat. xavi still plays more deep and passes from there, but iniesta is the one who can pick it up, shimmy through a tackle, and before you know it, he’s skipped right to the box and is threatening. without him, messi is going to have to continue to be playing deep which i dont always think is productive. there is nobody who can not pick madrid as favorites tonight. “Wednesday at 8.45 we will meet each other on the pitch. Off the pitch he has already won. “In this room (press room), he’s the f****** chief, the f****** man, the person who knows everything about the world and I don’t want to compete with him at all. “It’s a type of game I’m not going to play because I don’t know how. “Off the pitch, he has already won, as he has done all year. I was amazed to see the cool Pep explode in the pre-match press conference. Seems like Moaninho’s mindgames are finally beginning to rattle the Iceman. I wonder if this was the right time to react to Moaninho in such a manner because it clearly shows Pep is bothered by Moaninho’s remarks which will further build up more pressure on a team struggling to cope with injuries and a dip in their lofty performance standards. I fear this is exactly what Moaninho was looking to achieve – to unsettle the calm and dignified Pep. Alternatively this verbal assualt could also galvanise the team to deliver a match-winning performance. To be honest [and most people generally don’t like it when I speak my mind], I don’t think the starting XI we will put up [minus a regular LB, a makeshift CB, a midfield solely reliant on the creativity of Xavi and without Iniesta, a three man forward line in which only Messi seems to be playing to his potential of late] against a very organized and talented Real side will be able to execute the Barca playing style we have also become accustomed to in recent seasons. I don’t want to sound like a pessimisst but surely if there was ever a chance to knock Barca out of the CL – this is it. The backline is in disarray especially with 1 regular CB and an adhoc LB who is also probably not 100%, the midfield which has been the main source of Barca’s attacking forays has been shackled by the 3 CBs that Moaninho has employed and our forward line except for Messi seems to have misplaced its goalscoring touch. Yes the task is very difficult if not impossible but I wish to reiterate my earlier observation regarding great teams and good teams. Barca’s starting XI despite the obvious shortcomings must call upon its collective team spirit [similar to the 2009 CL final] and desire to go down in history as a great team rather than just a very talented side that failed to win the Cl after 2009. If this is a great team [which all of us believe that it is] then they must RISE to the occasion and reclaim their CL title which we probably should have won last season. Getting knocked out of the CL in consecutive seasons by the same coach with different teams is simply unacceptable for a team of Barca’s stature. I was a bit worried too at Pep’s reaction but there was bound to be a point when he said enough’s enough. I think the fact that Mourinho so casually called him “Pep” during his attack irritated Guardiola as he has always called Mourinho “señor Mourinho”. I’m sure Pep hasn’t “lost it” completely and hopefully his passion will transmit to the team. I have a feeling that Barca will pull out all the stops tonight. Sure we have no proper LB, no Iniesta (confirmed on the official website), it’s the CL semi-final against Madrid the players will be fired up and highly motivated, But Barca will have to be alert. Its gonna be tough and nail biting but we CAN do it, we must just keep the belief. Madrid being favourite might work in our favour as they will be under more pressure, all Barca needs to do is to continue to play their way and keep the ball and not give it away cheaply and be patient, as this will frustrate Madrid. Madrid not having Khedira and Carvalho, means that they cannot, play their normal way. Sure they have options in midfield, but Lass is’t who he was before he went to Madrid and Granero isn’t the best… If Madrid get frustrated it’ll come frm Ramos and Pepe, who will most likely be carded. Madrid are only just favourites compared to Barça to win the first game. Not sure exactly but the odds for tonight’s game are more or less: Madrid to win 6/4 (2.50) Barça to win 13/8 (2.60) with the draw at 9/4 (3.20). If we take a draw as a positive result that gives us a better chance than Madrid of being happy tonight. All depends on how you look at it. I don’t warry about this game we have alot of options…. what ever happens barca always is barca…. i hope we will win or atleast draw…..
mourinho is dirtiest coach in the world..
this team although there is some circumstance. I just loved Pep getting all annoyed! I will bet he did it deliberately and not cos’ he crumbled under the pressure. I think it’s exactly what the team needed, a wake-up call, we’ve missed a bit of venom since the turn of the year and if it helps us to play with a bit more urgency it will be for the best! Fantastic game to play, horrible timing, the team looks weaker as it has ever done with Pep at the helm, but in similar circumstances in 2009 we went through so I will hope for a formidable response from this fantastic team, just so they can forge their legend a little further! i will be very happy with a 1-1 or 2-2 tie today. Barca’s possession is a different story at home. Worth stating: we don’t have to win we have to tie. As noted, we’ve outplayed them every game so it’s likely we’ll at least get the tie and go home to seal the win in a healthier state. Also worth noting: Madrid can’t play especially dirty due to yellow cards. That will affect game a lot, I suspect. Expect a more open game, less hacking. Damn FSC! I can’t believe they are not carrying the game live. Corporate dicks. Just for the record Ramos, Albiol, Di Maria and Ronaldo are all on a suspension if they see yellow tonight. A small point in our favour. Doing my best to approach this match with a modicum of calm, but feel I will likely do what I do for all of the highly stressful matches and just start drinking soon! Missed the last Classico – not sorry that I did, firstly as we lost, and secondly because I was getting engaged (she said “yes”!) – but from what I’ve heard we lacked intensity. If the war of words will have done anything, I think it will have brought an already… excitable tie to fever pitch. We will need to out-work them; to out-play them goes without saying. After readin’ through all everyone has got to say, I think I’m the only one who feels the least worried about what our startin’ XI would be. And the fact is: I DON’T CARE!!! We are Barça and like Barça we shall play. I’m very much optimistic and the outcome of tonight’s encounter CANNOT decide the tie. I’ve got this feeling that BARÇA will step it up amazingly tonight and finally establish themselves as the world’s greatest when they lift the UEFA CL on the 28th of next month. Fret not culés!!! Can’t comment too long (twin boys in my arms)…but I think that this is sad for football. At halftime, all that Madrid has done is park the bus….how sad…how sad…. what an absolutely cracking result. i feel so vindicated for pep and our team. for all their money and all our injuries, we showed true football and ability. a victory for pep, a victory for barca, and a victory for football in general. guess mou isnt such a genius now huh? guess he hasnt really figured us out. That was incredible. Simply incredible. 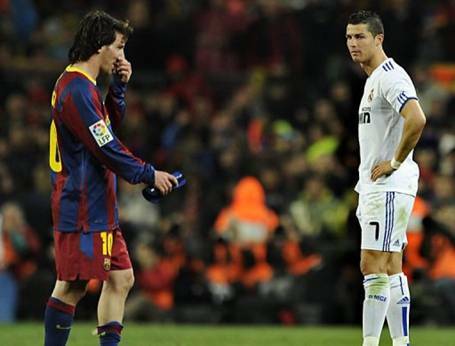 No you are just blabbing we will send you back, as we have last final, and also RONALDO RONALDO RONALDO is the best.